But USC was not close last year. USC had fewer total points, yards, and first downs than its opponents, and it had more penalties and more turnovers than its opponents. Good teams don’t have numbers like that. The reality is that USC was mediocre or awful in virtually every major category. The Trojans didn’t lose seven games in 2018 because they were a good football team that had shockingly bad luck. USC just wasn’t any good. So where do things stand at the end of spring football? Better, I think. In fact, I believe there are valid reasons for optimism. Right now, before knowing the team’s injury status and the quality of the incoming freshmen class, there is a realistic possibility that USC wins nine games next year, and the Trojans might even win the south. How ‘bout that sunshine, Trojans? Now, when I pump sunshine, I like to stretch it out. Take a full-time pumper like my friend CP619; he can afford to expend large amounts of sunshine at once, knowing there is always more where that came from. Me, I need to be more judicious, not knowing how long the supply will last. So I’m going to give some thoughts on the big picture today, and I’ll deal with specific points on offense and defense in coming weeks. 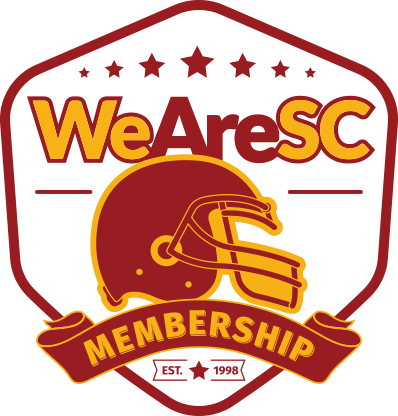 USC had four structural problems in its program last year. (I say structural problems because things like youth at QB and injuries in the secondary are problems that can arise regardless of the level of coaching and planning. They can happen to anybody. Structural problems are those that exist because of the way you have designed and built your program.) First, USC was being out-schemed by the opponent on both sides of ball in most games, and the offensive staff especially was out-schemed virtually every week. Second, USC had a handful of assistant coaches who had proven themselves to be incapable; at O coordinator, O line coach, and DB coach, USC’s staff members may have been the worst in the conference, and the talented D linemen were making very little progress under BKU. Third, USC was remarkably undisciplined, and therefore penalties, turnovers, and missed assignments were devastating almost every Saturday. Fourth, USC was physically and mentally soft. Most of these problems did not pop up for the first time in 2018, and I have argued that Clay Helton probably should have addressed them earlier. That said, there’s no time like the present, and Clay Helton has taken steps to address three of these structural problems. He has upgraded his assistant coaches, including by turning the offense over to someone we think is likely to be a good strategist and play caller (and will be a major improvement even if he is only competent), and Clay himself has wisely kept his hands out of the offense and has focused his attention almost entirely on discipline issues. 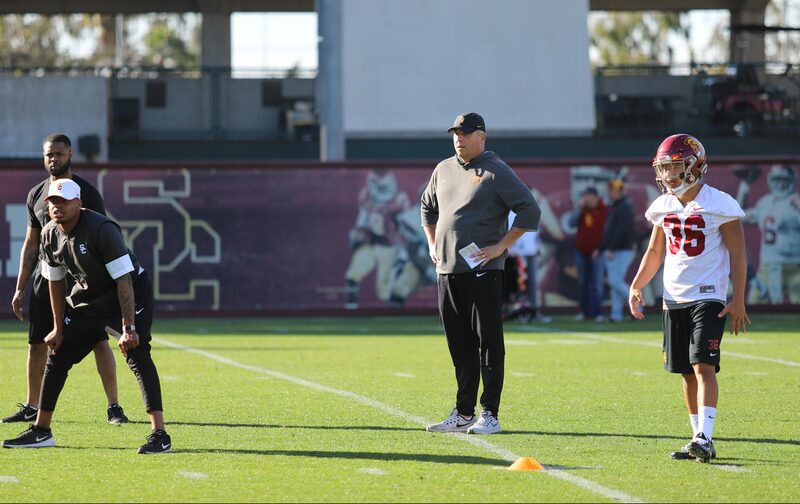 The word is that USC’s staff will not tolerate penalties or missed assignments any longer. Good. It’s too early to know how these changes will play out, but the fact that Clay is addressing these issues and has a plan to fix them is a major step in the right direction. These changes, and the likelihood of a regression toward the mean (it’s unlikely USC would play so far below its capabilities in consecutive seasons even in the absence of changes), mean that USC should be better, probably significantly better. Am I still concerned that another disastrous season could be on the horizon? Yes. Because of the fourth problem, the softness of his program. I think Clay Helton simply disagrees with those of us who levy this criticism. USC’s season, and Clay’s career, probably rest on his being right and critics like me being wrong on this issue. I say Clay disagrees with us, because he has not identified softness as a problem in any of his public statements, and he doesn’t appear inclined to make changes to address it. Indeed, even his move to the new offense lends further support to my theory that he rejects my analysis. On the hard-nosed to soft-as-Charmin scale, the move to the Air Raid is a step in the direction of Charmin. It’s probably the right short-term move for the program in light of the wealth of talent at WR and the questionable nature of the OL; and if you’re a soft program, it probably makes sense to run an offense that doesn’t depend on your guys playing like bullies. But, as I noted, Clay has never stated publicly that the program needs to get tougher, and based on what I saw last week on television, the practices still lack the type of physicality and aggressiveness that you would have seen under Pete Carroll (or under Nick Saban). Is this a problem? That depends. For all the talk about how tough the schedule is, and it’s not an easy schedule, only Notre Dame has comparable talent. We’ll talk more about this in later Musings, but just note that USC’s top four receivers and top three running backs will all make NFL rosters, and the majority of those guys will play on Sundays for many years. (This doesn’t even include young guys like Kyle Ford and Drake London who look like NFL players already.) USC should win a lot of games because its opponents simply cannot match up with these guys physically. But many of the opponents on next year’s schedule, including all of the first six, really believe that they are tougher than USC and that their toughness will carry the day. They believe that they have worked harder, that they are more physical, and that on a critical 3rd and 1, they will push USC around. They do have some film to support that belief, as this happened a whole lot last year. Has this changed? It’s going to be very difficult to beat the Irish in South Bend unless USC is physically and mentally tougher than it was last year, and there are a few other games – in Seattle, in Provo, at home against Stanford, Utah, and Oregon – where this Achilles heel could bite Clay and the guys. And while I feel comfortable saying USC will never win a national title unless it makes a renewed commitment to being tougher, USC was 5-7 last year, so talk of national titles is silly anyway. Can USC win the Pac 12 with Clay’s approach? Absolutely, and USC has a chance to do so this year. By the way, props to Clay Helton and staff on Kedon Slovis. I’ll admit to being skeptical of this guy’s recruitment, and I suspect a lot of you are in the same boat. But it appears the kid can really play. Good job, coach, doing your homework and pulling in a guy that was clearly underrated by the recruiting services and other programs. It will be exciting to watch Kedon’s development. So Lynn Swann is signing autographs on the east coast? Makes sense. Pac 12 television coverage being what it is, people on the east coast might not have followed Swann’s career trajectory over the last few years. His brand may still be hot. If we see any more scandals and public show-tune performances, however, Swann may be forced to make his public appearances even farther afield, maybe at autograph shows in Guam or Madagascar. I know this autograph thing bothers a lot of people. I’m not offended. And I’m not bothered by his golf. I’m bothered that all of USC’s three major sports teams were raging dumpster fires in their most recent seasons. I’m bothered that the athletic department is in the center of another national scandal and that USC’s leadership is always blindsided and never responsible. I’m bothered that the Pac 12 falls farther and farther behind the other major conferences, as it pours money and luxury on a commissioner whose plan for the conference has the conference closer to the Big Sky than the SEC and Big 10. But I’m not bothered by Lynn Swann’s autograph signing. It’s probably the least-harmful thing he’s been involved with in some time. In fact, I’d love to join him. If anybody wants to pay $225 for my autograph, I’ll pull up a chair between Lynn and Tonya Harding and sign anything you put in front of me. I referenced my terrible track performance in Poland in the last Musings. I won’t bore you with the details. Let me just say that it involved missing my heat, begging to run in a later heat, being allowed to run in a later heat, then screwing up the placement of my blocks so I stumbled at the start. You can’t stumble at the start of a 60-meter race and hope to perform well. Even so, I can now include this experience to my growing list of unusual athletic endeavors, a list that now includes grappling matches against assorted odd characters who wander in off the street, including a guy who had just been released from prison after 10 years and another guy who claimed to be a ninja (I survived both), an amateur boxing match ( I won), a mano-y-mano duel in Olympic style weightlifting against the British national champion (I lost), and a trash-talk fueled at bat against MLB legend Bob Welch. (He was preparing for spring training. I was 15 and an idiot. He had struck out the previous batter with a wicked curve ball. I told him not to try to get that curve past me. He said he doesn’t throw curve balls to little guys, and he proceeded to throw three straight fastballs by me. I sat down.) So if anybody wants to take on a jai alai challenge in the Pyrenees or a shin-kicking tournament in the Cotswolds and is looking for a plus one, I’m probably your guy. Give me a call.